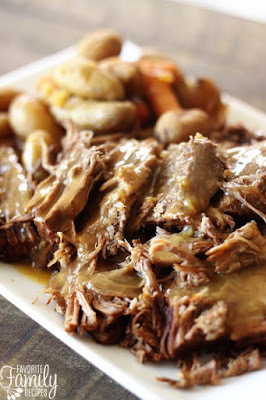 Sprinkle pot roast with salt and set aside. Olive oil to Instant Pot and set to "Saute". When oil becomes hot and shimmery, add pot roast and sear for 4-5 minutes on each side. Add beef broth to Instant Pot. shake until vegetables become evenly coated with mix. Put veggies in Instant pot and distribute evenly around roast. Place lid on Instant pot with steam valve closed. minutes seems to work ok, judge the time depending on the size of your roast). Do a natural release for at least 10 minutes, then quick release. Remove roast from instant pot, slice, and serve with vegetables.